Austwick Berry is an independent family run estate agent offering free valuations and competitive sales and rental fees. 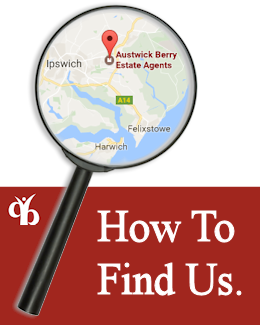 Austwick Berry sales and lettings have now become the market leading agent in the Ipswich and Kesgrave areas simply by offering transparent, honest and friendly advice. We're members of the Ombudsman for Estate Agents scheme, which means you can have complete confidence in the quality and integrity of our service. Whether you're looking to sell, buy or rent a property call us today for a free no obligation valuation. "Thank you so much for finding us our first home and all the effort you have put in to push the sales through. You can pop in for a cuppa anytime." "Tony, Andrew & all at Austwick Berry, Just to say thank you for all your help & support with regards to selling our house. Best Wishes." "Special thanks to everyone for providing such professional service in selling & buying our houses. Everything went smoothly and we are really happy with our new home."